I ran out to where it’s about 100′ deep, but the bottom was pretty darn dull (or the side scanners weren’t seeing well). I got a kick out that rocky ledge shown on the screen above, though. It shows as just a 25′ hump on the NOAA charts (and isn’t well presented on that Navionics chart at this zoom level). I’ve been boating over this bottom for 40 years and didn’t know that much of it is quite smooth, with an occasional ledge like this. It would be valuable information if I was fishing or trying to anchor around here (or trying out underwater cameras). I have to say that I’m not finding Lowrance’s exclusive “down scan” view of the high resolution pings all that useful. You can see it in the upper left window above and upper right on the screen below. 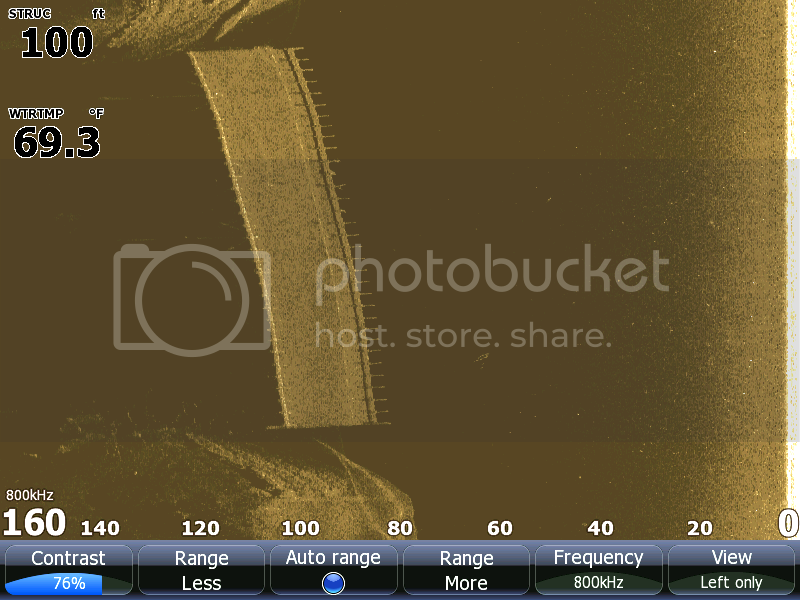 It does give some nuance to the similar sonar view, but you have to get right on top of something to image it. I tried to get on top of that interesting cross seen lower left below — possibly a couple of railway ties or tracks from an old ship hauling ways — but failed. 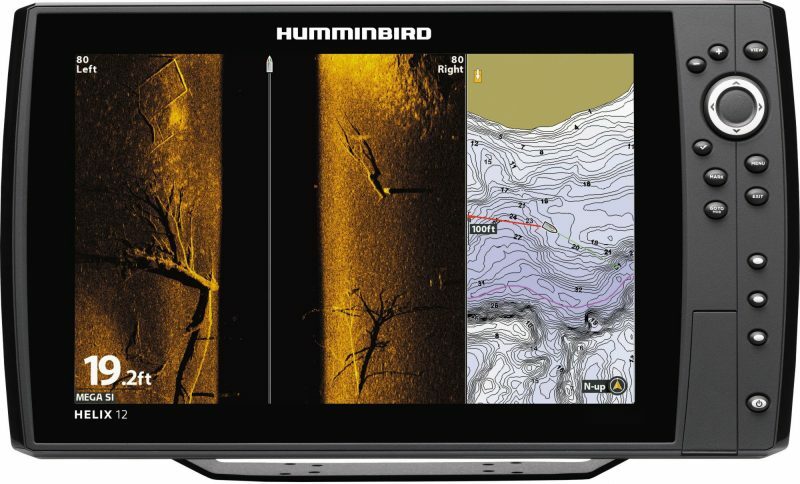 Besides, Humminbird has already announced its own free upgrade to down scanning. Another thing of note on the screen below is those blue bars beside each window. I recorded a lot of StructureScan info — including the present lay out of all the Inner Harbor mooring stones — and can play it back on the HDS, even adjusting settings and display windows. The Humminbird has a similar feature, though I’ve been having a little trouble with the recording causing the side imaging screen to freeze or stutter. I may need to adjust some settings, and, by the way, the 1197C does give you a bit more control of imaging enhancements. More to come. Side scan? I’m looking forward (so to speak) to a discussion of affordable forward-looking depth sounders. Forward scanning is an entirely different challenge than this side scanning, and apparently much harder to pull off effectively. I’d love to have a good FLS, and there is a very interesting new product that I will write about soon, but what’s your definition of “affordable”? Ben, I’ve been looking at these side scan units but I believe that anything deeper than say 100ft they really struggle. I can see their use for inland fishing where you’re looking for submerged trees olong river banks that may be holding fish but i struggle to see its use in deep water or for navigation purposes? bring on the FLS news…now there’s a market just waiting for the right product and price. Have you reviewed any FLS systems on Panbo yet? Well, that is the conventional wisdom, John. But aren’t there a lot of saltwater fish that hang around structure that’s less than 100′ deep? And don’t you usually anchor in even shallower water? At any rate, new options in FLS later today. I have a question. In the lower left corner of the second screen shot there’s an orange warning bell icon with exclamation mark. I don’t have alarms enabled on my unit so the only time I see this is when there’s no GPS fix (when I forget to power up the NMEA network). What was happening in this screen shot? I’m sure there are fish in salt water below 100′ deep Ben but I’m only interested in deeper water, hence my question. Does it work in deep water (ie: >100′)? so about the double post but something weird happened when I submitted my post. 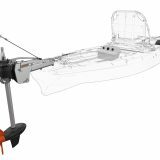 FLS would be far more useful for checking anchorages so I’m looking fwd to hearing more…..maybe Furuno FLS7000? 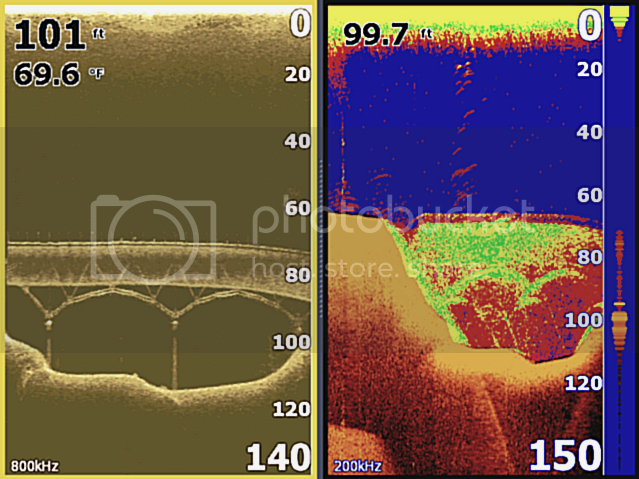 With side imaging you could drive around in circles and create a detailed image of the anchoring bottom, but it won’t help you see shoal ledges you might run up on. With FLS you could drive around in circles collecting a cruder mental image of the anchoring bottom, but it should help avoid a grounding. Neither technology does the job perfectly, but both help. 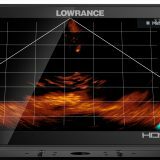 ” I have to say that I’m not finding Lowrance’s exclusive “down scan” view of the high resolution pings all that useful”. I realize your impression is based upon usage and bottom structure viewed but….. I found a standing, submerged bridge with down scan. Although conventional SONAR marks it well, a lot is left up to interpretation. With down scan identification is no-brainer. That’s an amazing image, JD, but didn’t you have to drive perfectly in line with and over the bridge to get it? Also, didn’t it reveal itself first with side imaging? Yes and no. When I first located the bridge I was following a river channel using down scan/GPS, split screen. I proceeded to locate the four corners, dropping way points at each. As you imagined I did have to drive in a straight line to get good captures. If not, the bridge looked distorted and twisted on screen. Admittedly, it took several passes to get it right. I did drive directly over it but found the most detail and best shot while slightly paralleling. Here’s a left side scan of the bridge for comparison. Same reporter, same company but different rep.
StructureScan is available in the US now, so the install and operation manuals are online. 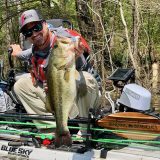 The install manual says when the transducer is mounted on a trolling motor, it “Allows you to scan areas by moving trolling motor left/right”. That hints that a swiveling transducer mount at the bow might be used as an FLS feature. Sorry, Norse, but even making a sharp turn when you’re using Side Imaging or StructureScan causes quite a bit of smearing and distortion in the image. I can see how you might be able to carefully swing a trolling motor from a still boat and build up some useful bottom imagery, but turning the transducer forward and then moving in that direction isn’t going to work. I’m pretty sure that you’ll get a smear, not a scan. It’s important to understand that these detailed images are not created instantly; they’re built line-by-line as the vessel moves in a straight line at a reasonable speed. You are right about the sharp turns, but I’m guessing that a slow steady turn still produces a good image. The scanner does a finely focused up-down scan but it relies on boat movement to build up the image in the other direction. Horizontal scanner movement or rotational movement should both work to build the image, but the interpretation of that image will be different. Call it distorted. What I don’t know is how StructureScan decides on the scrolling rate. There is no mention of any control for it in the manual. Is it by GPS speed input? Or is it just a fixed rate? A scanner fixed to look forward isn’t going to produce a good image of the bottom, but it may help to warn of upcoming rocks anyway. If it could be carefully swung from side to side, looking forward from a slow moving boat, it may be useful to thread the boat through a narrow channel. Maybe or maybe not. It would be fun to test. The patent office should either clean up its act or disband. On first glance this looks like nothing more than a snow-job. Wikipedia shows a long history of side-scan sonar. The novelty claimed in this patent is that it is attached to a boat instead of a towfish. That sounds rather trivial to me. Then at the end of the text they also claim the rights to any variations on it anyone else invents. Too many lawyers.